cant wait to see the full review!! Anyone else think those sata power connectors for the PCI-E slots are genius? Why haven't we seen those before instead of power connectors mounted half way up the board? Really hope those catch on. Karlos its what happens when they let an end user design the product, we know that placing things in the right place can make things so much better for us. The fan headers are another example of this tbh. Really I think its because when you put the board on subzero cooling the more normal places for them are unavailable as the pot/mount/insulation block access. why do the board manufacturers forget about the system panel connectors alignment, compared with the latest 'chunky' 2 (and 3 slot) GPU cards? these GPUs overhang over the connectors, making it impossible to fit the last graphics card into last PCI-E (#4 in the scenario). unless you broke your GPU warranty, but replacing their cooling solution with your own, four-way crossfire would be unobtainable! 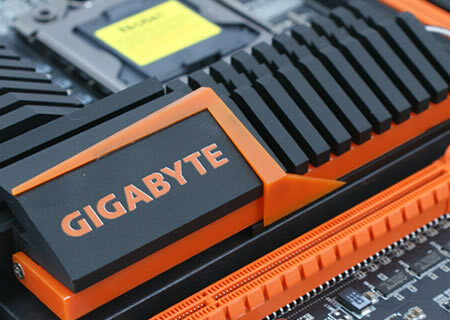 what do you no about the gigabyte x58-oc? magic,hole lotta magic! this thing f rocks! the people who buy these boards wont be putting them in a case dug so front panel connectivity isnt an issue, it has power buttons on board and they are what will be used. its a board for benching not to live in a case imo.